You are here: Home / The Best Website Builder For Your Website / Yola Review: How Does This Website Builder Measure Up? Yola Review: How Does This Website Builder Measure Up? Often, creating a site requires more than just a good web builder—an image editor, a help center, and third-party widgets are often part of the process as well. Yola, on the other hand, offers most tools built right in, so users can edit their images or ask questions without ever opening a second browser window. With nearly all the tools right in one place, Yola is quite simple to use. A WYSIWYG (What You See Is What You Get) editor, it's easy for users with no experience to create a site, while custom HTML options offer more for advanced users. While not perfect for every type of site, there's a reason Yola has powered so many websites. Just a name and email will get you set up with Yola's free version. 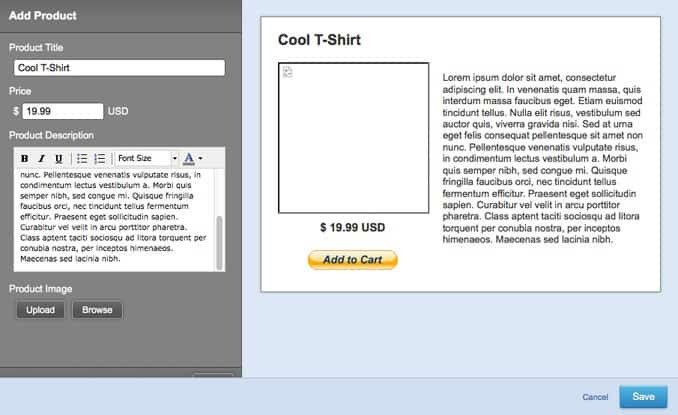 New users are then directed to choose their template, or to start with a blank site. There's currently just ten options in the free version, but there's several more options within the silver and gold paid plans. The designs are mostly clean and modern, and even within the free options, there's still a good amount of variety. The theme can be changed at any time, with most of the content converting over to the new site—items adjusted under the style options like background images and fonts appear to be the only elements that don't transfer over. 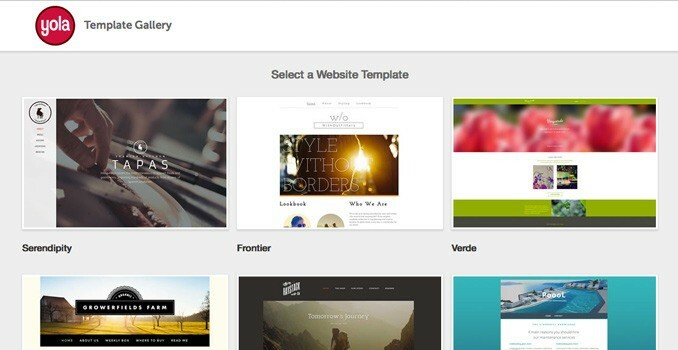 With the theme selected, users choose their website name (which can be updated later). Choosing the type of website (i.e. restaurant, photography studio, etc.) helps get the right sub pages set up automatically. Yola also requests contact information here, but it can be skipped. From there, new site owners are taken straight to the editor. Using Yola, users see their site as they make changes, making it fairly simple to use. The tools, options, and settings are organized in tabs at the top of the page, with the editable version of the site below that and direct access to the support center in the bottom corner. When you start with a template, Yola automatically adds a few pages with text and images. Adjusting these default items is simply a matter of clicking on them. For items not already part of the template, the Widgets tab organizes all the options. There are a lot of different elements users can add, but the layout makes them easy to find. The most commonly used options like text, images, HTML code, and forms are under the popular sub tab, plus there are additional options for media, eCommerce and more. If you can't find what you're looking for, just type it into the search box. New items are simply dragged onto the page and adjusted from there. Elements cannot be added anywhere you'd like though, for example in the template we chose, we couldn't add anything underneath the last button link on the home page. This limits the design somewhat but also helps to keep it simple. Yola features a built-in image editor, so photos can be tweaked without ever having to leave the platform. All uploaded files are also organized and accessible, so it's easy to add the same image in multiple locations. Adding new pages is also fairly easy—just hover the mouse over the navigation bar and click add. Unlike most website builders, Yola doesn't simply add a blank page—they offer layout options, which makes it simpler to set up pages. A new page can be added to various column options or just a blank template. The column option (which can be added to any page) helps keep the site organized and is a boost for users who aren't skilled in design. Additional options like headings and backgrounds are available under the Page tab. Navigation can be edited just by selecting the navigation bar. The navigation can be divided into pages and one level of subpages—that's fine for most simple sites, but websites with a lot of pages would need additional subpages to really keep things organized. Unfortunately, that's not possible with Yola. Most changes are done in the WYSIWYG editor, though there's a style tab for a few options that aren't. This tab helps create a universal look across all the pages with unifying fonts, colors, and backgrounds. The site tab offers access to settings, stats, and other options, while the SEO tab (available only in paid packages) provides search engine tools. Yola has two options for selling products—through a PayPal widget, or with their built-in storefront. The PayPal app is very basic but gets the job done for free. PayPal will be familiar to most customers (as well as store owners) and allows users to add prices, images and descriptions. Yola's storefront option is about $23 a month—there's no free trail, but according to a customer service representative, the first month is refundable for users who aren't happy with the platform. The built-in storefront expands from the PayPal widget's basic options, allowing for features like tracking inventory and communicating with customers. The one element that Yola doesn't have built-in is a blog platform. Users can import a Tumblr feed through a widget, but can't directly add blog posts like many website builders allow. Because of this, Yola isn't ideal for a blog, though the widget makes it possible to add a blog as a subpage to a business site. Yola has a lot of features built right into the editor. The help center is a small box in the corner users can access without opening a second browser window—with articles, online chat and email easily accessible. The help team was quick to respond to our questions and answered thoroughly. A photo editor is also built right in, and many of the widgets can be used directly within the editor with no additional steps. Yola is also well-organized. Between the tabs and search box, it's easy to find widgets and page elements. Items are just dragged and dropped into the WYSIWYG editor, making an all around simple platform. While there's a lot to like about Yola, the navigation is limited to just two levels, so it's not the best platform for complex sites with a lot of pages. Without an integrated blog platform, it's also not ideal for creating a blog. Yola's free version allows users to create three pages on a site with a Yola sub domain. The $5.95 a month basic package has unlimited pages and a custom domain. It's not until the Silver $12.95 a month package before the Yola advertisement at the bottom is removed, and the unlimited $24.95 package offers even more options. Discounts are available when purchasing a year at a time as well. Overall, Yola is quite well organized and simple—but before making a decision its worth considering other platforms we rate higher.